On January 1st of every year under US Copyright Law, creative and scientific works that have reached the end of their copyright terms go into the public domain. These works are then open for use and distribution by the public without restriction. Sadly, the 1976 copyright term extension passed by Congress have pushed pretty much all copyrighted works out of the public domain. Prior to 1976, one could get a copyright on their work for 28 years and extend that copyright for another 28 years if they so wished. After Congress extended copyright terms, all works previously covered by copyright, and all new works, had their terms extended automatically to life of the creator plus 50 years. In 1998 it was extended once again to life plus 70 years, or 95 years if the work was created by a corporation. Every year on January 1st, The Center for the Study of the Public Domain at Duke University publishes a list of all the works that would have gone into the public domain had the 1976 copyright term extensions not been passed. 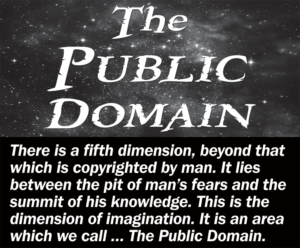 Had copyright terms remained at a maximum of 56, we would see a good number of works enter the public domain. Sadly, under the US’s extended terms no works will go into the public domain until 2019, that is if Congress doesn’t extend copyright terms again. So what would have entered the public domain under the old 56 year terms had they not been extended? Let’s find out. Keep in mind that these lists are not inclusive as these are just some of the more popular works published 56 years ago. There is also some great music that we are missing out on. January 1, 2016, would have been a melodious day for you under earlier copyright laws. The original Broadway version ofThe Sound of Music (music by Richard Rodgers, lyrics by Oscar Hammerstein II)—including the songs Sixteen Going on Seventeen, My Favorite Things,Edelweiss, Do-Re-Mi, Maria, So Long, Farewell—would be available. So would Love Potion No. 9(Jerry Leiber and Mike Stoller), Kind of Blue (Miles Davis, Bill Evans), What’d I Say (parts 1&2) (Ray Charles), and Come Dance With Me (Sammy Cahn, Jimmy Van Heusen). Your school would be free to stage public performances of the classic songs from The Sound of Music. Or you could set a film to the music of Miles Davis. Today, these musical works remain copyrighted until 2055. What makes matters worse is that in Canada and many parts of Europe, thousands of works have entered the public domain on January 1st.